Martha, a SAFCC volunteer, has been helping and trapping throughout her Southcross and New Braunfels area for years, one family at a time. Martha identified a dumping area at a small trailer park with over a dozen 3-4 month-old kittens plus some adult cats and took on the task of a mass trapping. Within two days, Martha got 12 cats. The weather turn cold and the remaining cats disappeared seeking shelter. In order to not mix up the recently fixed cats with those still needing to be trapped and fixed, Martha kept the first 12 feral cats in her home for a week so she could trap the others. Overall Martha caught and recovered 23 cats from the trailer park-a clean sweep! 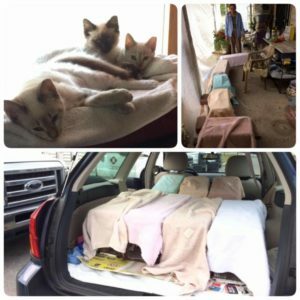 Sandy, another SAFCC volunteer used our cat van to deliver traps and transport all the cats to and from the spay/neuter clinic. The three Siamese-looking kittens pictured here-were fostered and socialized within one week! They ended up at the San Antonio Humane Society for adoption. The feral and stray cat population will never dwindle unless people like Martha step up and take responsibility for cats in their local area. Thanks to Martha, the number of kittens in this trailer park will be greatly reduced and all the cats have been fixed and vaccinated!